Text #1: Convo at breakfast...Niece #1 "I think I know who made these muffins, a girl named Megan." Niece #2 "We should call her and tell her we love them and thank you very much!" My Text Reply: Tell them I say you are welcome. I love the way kids think! Text #2: Niece #2 just said tell her we are going to need some more muffins! They were talking about the pumpkin chocolate chip muffins Barbara over at Frugalista Farm Life and I made during Freeze-O-Rama. We fixed up three double batches which made about 90 regular-size muffins and 100 mini muffins. I love these muffins right out of the oven, so I was glad that some of them were enjoyed right away and not put into the freezer...although we did include reheating instructions with each bag! In addition to the muffins, Barbara helped me put together 12 jars of Texas Two-Step Soup Mix. We were pinch-cooking for Leah over at Beyer Beware. Check out her post with the recipe here. Here are the final products. Since we didn't have as much prep work on our dishes as some of the other gals (These ladies were COOKING...I was amazed at the number of potatoes peeled, bacon fried and manicotti filled. ), Barbara and I got to enjoy some of the other activities we planned for the day when we thought that we were all cooking in a small kitchen. Luckily the kitchen we were in was wonderful...lots of counter space and a large commercial oven! Cris over at Goodeness Gracious brought her huge collection of Gooseberry Patch cookbooks and we looked through those. Barbara picked out a couple for her Christmas list, including Cris's suggestions of Best-Ever Casseroles and One-Pot Meals. Then we received some cake decorating tips from Liz...you should have seen her tackle supply box with her decorating tools. She is a pro! Check out this post of hers. She showed us how to do roses. Then she showed Big Sissy from 3 Pigs her tricks. But Big Sissy really wanted to try it by herself. It was a wonderful day. I love spending time with these women. I learn so much from them. There are single women, married women, married women with children and married women with children and grandchildren in the group. But when we get together, we are just women who enjoy each other's company. 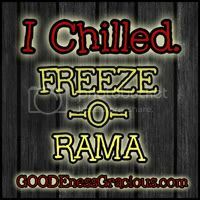 Now to the food...if you are interested in some of the recipes that were cooked up and shared during our Freez-O-Rama, check out Goodeness Gracious by clicking on the button below. Looks like so much fun!! Bummed I missed out! Hi, I'm stopping by from the Tuesday blog hop. I'm a new follower. That looks like fun...I feel like I'm behind on my holiday baking now. That looks like fun! I'm not very crafty myself so thinking of this with cooking would never have occurred to me. Thanks for linking up with us on the train ride this week! We are looking forward to seeing you next week! Hi there! 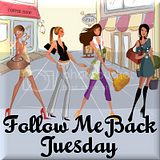 Just stopping by from Follow Me Back Tuesday blog hop. Take care and make it a great day! I have to tell you that the only muffin I got was the mini I had on Saturday. My family cleaned them out--and didn't save any for me! You got a two thumbs-up from our house! No fair you were eating your own food on Saturday. I can't wait to give these a try. Mine are tucked away in the freezer to save for the holidays. Our muffins hardly made it home. Big Sissy loved them. In fact only one mini muffin made it to Monday. Thanks for helping to entertain Big Sissy while I was trying to get Little Sissy to sleep. I would love to know how you all get together and efficiently prepare all that food. It sounds like you had a great time. Sometime, when you get a chance do a post on the whole concept! Our muffins didn't make it to the freezer...Everyone loved them! Great recipe choice! I am going to have to make them soon!! what a great idea... so glad you had a great time! This looks great. I have always wanted to try stuff like this but have never gotten around to doing it...maybe this will be the year.